We have organised both our booth and our attendance to grant visitors a comprehensive overview of what IMA really represents in the pharmaceutical processing and packaging market. Today’s industry is experiencing a paradigm shift, having to face, all at once, increasing digitalization and increasingly stringent regulatory frameworks in a tough and competitive global environment. Greater production efficiency is certainly no longer enough. So there we are. IMA arrives at Achema to present its perspective of how the pharmaceutical industry is meant to be: a complete portfolio featuring the launch of new machines, new technical solutions to specific production issues, pilot projects for Industry 4.0, unique approaches to manufacturing processes and turn-key applications. Each of our exhibition areas welcome visitors on a journey that unveils the opportunities available to them in several manufacturing stages. A virtual as well as a real-life tour through the Smart Factory of the future. Visitors entering the solid dose area can meet our specialists in dispensing, handling, granulation, tableting, capsule filling and coating. For this edition of Achema, CROMA, our latest development in continuous coating, is playing the lion’s share, in step with current production scouting trends. Different levels of containment solutions are on show, with our ADAPTA capsule filler and with PREXIMA tablet press. Our range of products for handling high potent solid drugs is completed by Spine, our partner SENSUM’s automatic visual inspection and sorting machine, while for complex solid dosage forms, our PREXIMA 800 bilayer version is just waiting to be discovered. Cost effectiveness and flexibility are the watchwords of the aseptic processing & freeze drying area, as we present three groundbreaking solutions, one for aseptic liquid filling, one for powder microdosing and one for freeze drying. As first outlined at last year’s Interpack, the INJECTA is our latest development for fill-finish for RTF syringes, vials and cartridges. Its robot driven manipulations and clean design have already drummed up quite a lot of interest. On the powder microdosing front, we are exhibiting the XTREMA PWD. Here, our engineers have focused on the alarm raised by the who about antibiotic resistance being one of the biggest threats to global health. They have devised a three-split powder filling solution – one of a kind in the world-, which fills three different antibiotics and does away with the powder-blending phase. 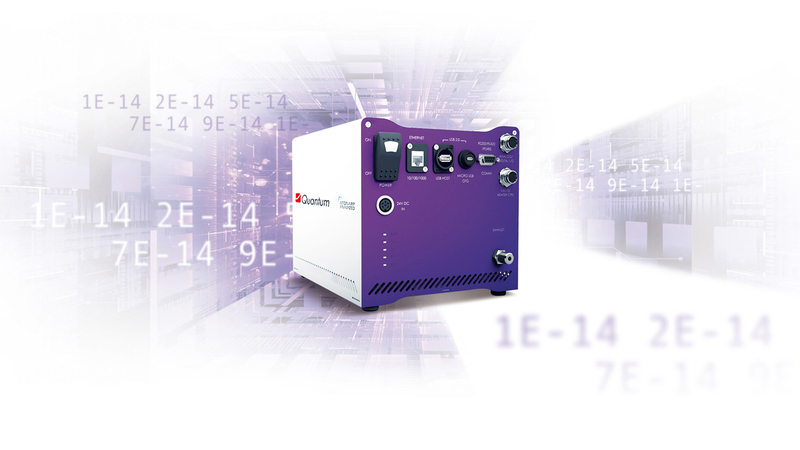 Our showcase can also boasts QUANTUM, a non-invasive technique capable of performing quantitative real-time process relevant measurements during the freeze-drying process. Across the aisle is the packaging area, with our masters in blister packing, counting, tube filling, cartoning, labelling and end-of-line equipment. This is where our company’s cross-divisional synergies are more apparent. 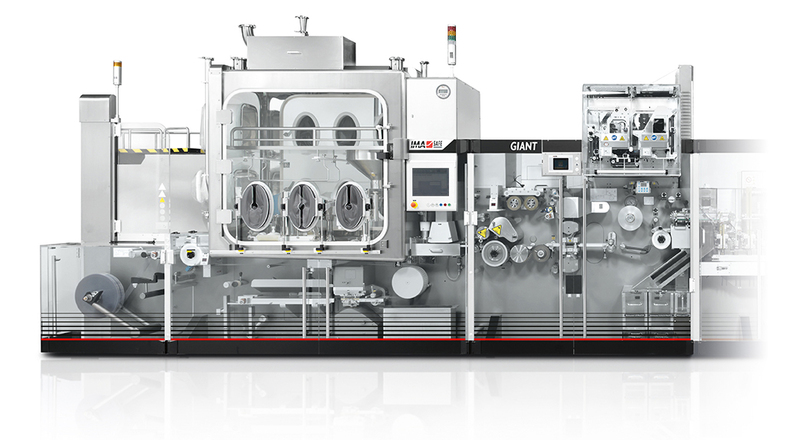 We have the GIANT blister-packing machine, equipped with a containment application developed together with our colleagues in Aseptic Processing, a response to the increasing demand for packaging high potent solid products. The VENUS washer, for washing components and parts, completes our range. Our packaging showcase can also boast UNILINE, the all-in-one complete bottle counting system and the C102V, a deep draw forming and sealing machine for packing ampoules, syringes, vials and bottles. While by no means new, drug counterfeiting and adulteration is still a global problem that is becoming progressively costlier, and one of the primary tools that pharmaceutical companies have to combat it is serialisation. The packaging line we are displaying, composed of a DYNAMICA cartoner, a Sensitive AP400T labeller and a CPH2 horizontal case-packer, includes features against package adulteration and, of course, for tracking& tracing. On show also a stand-alone Sensitive AP400C labeller equipped with printing and vision devices. For the first time an area completely dedicated to Automation, showing advanced assembly solutions for medical devices, such as inhalers, injection systems, diagnostic devices, infusion products and ophthalmic products. We are displaying the new EVO FLEX ROTARY, an ultra-flexible rotary platform with a servo-controlled pick and place mechanism. The machine has a space-saving design and is ideal for the assembly of large quantities of complex, market-ready products, such as medical devices with multiple components. 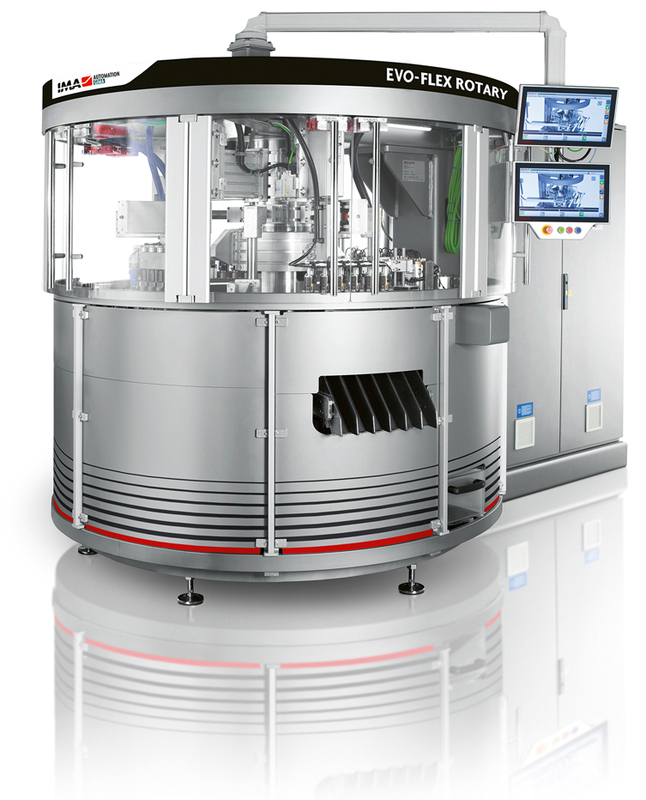 the Pilot Med, a demonstration machine featuring a flexible, automated powder dosing and weighing system. Among the more recent enterprise projects, one of the most outstanding is “IMA Digital”, comprising a series of digital functions already fitted and working on some of the machines on show. The man-machine interaction concept is quickly evolving, and we are bringing a practical experience to Frankfurt. Come and experience the Smart Factory with us! From Smart Factory to Pharma 4.0. Together.